Samsung is one of the foremost mobile phone manufacturers of Smartphone and have captured the market with this new Smartphone range. It is taking the world in inventive new directions and has been proving itself time and again by launching some of the best and feature-rich phones. It has recently launched its new phone, Galaxy Note Edge, which created a hustle in the entire Smartphone World. It was launched with a price tag of Rs. 64900/-. Here is a detailed review about this new phone from the leaders of the Smartphone manufacturer. The new phone is powered by a powerful Qualcomm Snapdragon 805 processor, which facilitates faster and better performance. Coupled with Quad-core 2.7 GHz Krait 450 CPU and Adreno 420 GPU, this phone enables you to play high-quality games without any hindrance. To further enhance the performance, the phone is equipped with a 3GB RAM. The phone runs on Android 4.4 (Kitkat) operating system, which is well-known for facilitating users to use a wide variety of high-end applications. Furthermore, the phone comes with 32GB Internal memory, which is big enough for storing data and also has a microSD slot, which allows users to mount microSD card up to 128 GB. This is really commendable as this phone can be used for storing ample data. Now-a-days, camera of a phone is really important and this phone sports a 16 MP rear camera that is capable of capturing spectacular images. It comes with optical image stabilization, which removes blurring of images along with fast auto focus and HDR that has a rich tone. It also features Dual Shot, Simultaneous HD video and image recording, geo-tagging, touch focus, face as well as smile detection and panorama. These features of the camera make it similar to a point and shoot digital camera, enhancing the photography experience of users. It enables recording high-quality videos using different resolutions such as 2160p at the rate of 30fps, 1080p at the rate of 60fps, 720p at the rate of 120fps. It also features optical stabilization and dual-video recording. The new Galaxy Note Edge also sports a 3.7 MP front camera, which can be used for recording videos at 1440p with a frame rate of 30 per second. 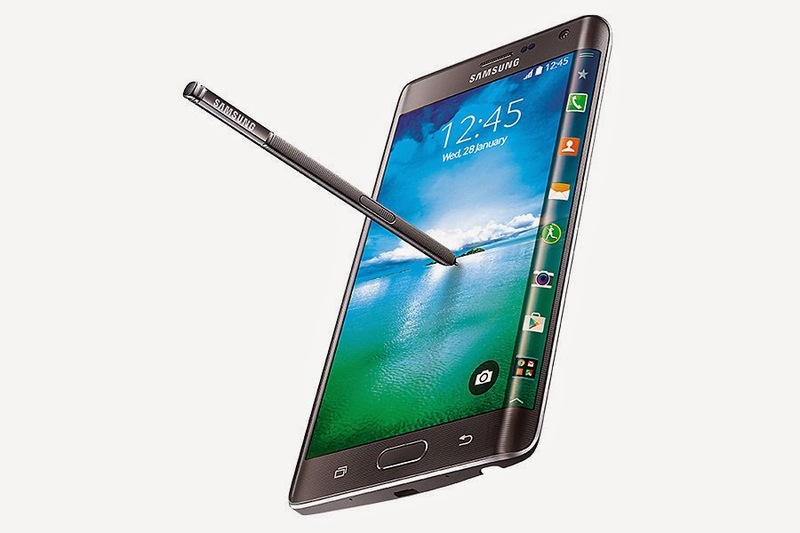 Samsung has equipped their new Galaxy Note Edge with a number of multimedia features, which makes it a great phone. As audio features, it supports Codec: MP3, AAC/AAC＋/eAAC＋, WMA, AMR-NB/WB, Vorbis and FLAC. Adapt Sound; Sound Alive, Wise Voice 2.0 and Extra Volume 2.0 are some of the other audio features of the phone. This phone delivers clarity and distinct sound, which is an added benefit. Apart from these, the phone is equipped with 3 mics allowing Directional Voice Recording. It offers a number of connectivity options as well. The phone supports 2.5G (GSM/GPRS/EDGE): 850/900/1800/1900 MHz, 3G (HSPA＋ 42Mbps): 850/900/1900/2100 MHz and 4G (LTE Cat.4 150/50Mbps) or 4G (LTE Cat.6 300/50Mbps). It also supports Wi-Fi 802.11 a/b/g/n/ac, dual-band, Wi-Fi Direct and hotspot, which enables transferring data to and fro to other devices Wirelessly. It also offers Bluetooth connectivity as it comes with v4.1, A2DP, EDR and LE support. GPS with A-GPS, GLONASS and Beidou, and NFC are the other connectivity options available in this phone. Samsung Galaxy Note Edge is loaded with a powerful 3000mAh battery, a little smaller than Note 4. However, the battery life of the phone isn’t that great as it lasts for 7 to 8 hours with a single charge. It has a standby time of up to 18 hours on 3G network and up to 67 hours of music play. The best part is that it charges 60% faster than its predecessors. Undoubtedly, Samsung Galaxy Note Edge is a great phone with a classy design and decent battery life, which doesn’t last long when used heavily. The camera and the connectivity options are also at par with its competitors, although similar to Note 4. It is a bigger and sleeker phone than Note 4 but comes with almost similar features, except for the screen size and bendable display. The only drawback that will keep the phone away from becoming one of the favorite phones is the price and minimal usability features.